Chatterbox Exotic P90 SMG in The Division 2 is an exotic weapon you can find in the game, by finding three components and the Chatterbox Exotic blueprint. This is easier said than done. In order to obtain the parts and blueprint, you’ll have to do some top-notch grinding. So, without further ado, here’s our Division 2 Chatterbox Exotic P90 SMG – How to Get to show you exactly where to find the parts for the exotic SMG, and how to get the blueprint. Where to Find Chatterbox Exotic SMG Parts in Division 2? 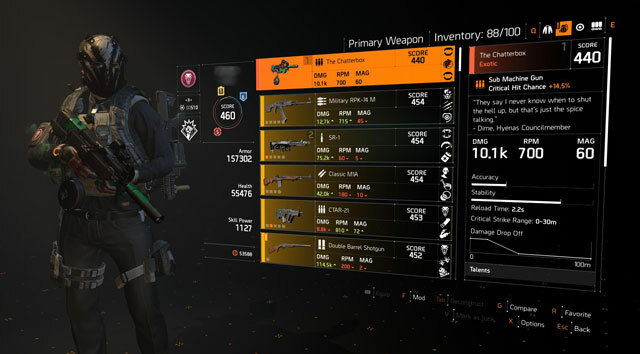 To get the Chatterbox Exotic P90 SMG parts in The Division 2, the best system is to do missions that have Hyena chests (or locked boxes, if you prefer). So, anything in Judiciary Square, Downtown East and / or West, and the Federal Triangle. We have found for you 7 HYENA CHEST LOCATIONS. There’s a total of three parts Chatterbox SMG parts to find. You can try repeatedly running District Union Arena, Grand Washington Hotel, and Jefferson Trade Center. Basically, you can search any Hyena caches east, south, or west of the Hyena stronghold. Unfortunately, the components for the Chatterbox Exotic SMG are random drops from the Hyena chests, so some grinding is inevitable. That said, it appears that the components are region-locked. This means that, once you’ve found the one in, say the Federal Triangle, you can safely narrow your search to the other locations. That should make things a little bit easier. The three parts in question are Modified Mods (from Judiciary Square), Creative Mag (from Federal Triangle), and Loaded Canister (from Downtown East). Chatterbox Exotic SMG Blueprint Location – How to Get? To get the blueprint for the Chatterbox Exotic SMG blueprint in Division 2, you’ll have to play the Bank Headquarters mission in Downtown West. The run will have to be on Challenging difficulty, and only after you’ve found the three parts of the Chatterbox Exotic described above. A new cache should appear in the hidden vault, from which the blueprint will drop. Oh, and you don’t have to collect a base weapon, like with the Liberty exotic pistol. The three Talents the Chatterbox Exotic SMG offers are Incessant Chatter, Box Magazine, and Blabbermouth. Incessant Chatter grants you 1% to rate of fire for every shot landed, up to 60%. It resets upon reload. Box Magazine gives you a 20% magazine refill for kills with this weapon, and a ten-second buff. With the buff active, every landed shot increases the magazine capacity by 1, to a maximum of 60 (you know, like real guns have expanding clips). Killing a target consumes the buff, completely refilling the increased magazine. lastly, Blabbermouth works like this: while holstered, reloading your weapon within five seconds after a kill grants 20% rate of fire for ten seconds. We’d like to extend a huge thank-you to Reddit users JiffyPaper and kitisthename for the invaluable information they’ve compiled. If you want to know more about exotics in The Division 2, head on over to our Division 2 Exotic Weapons guide.